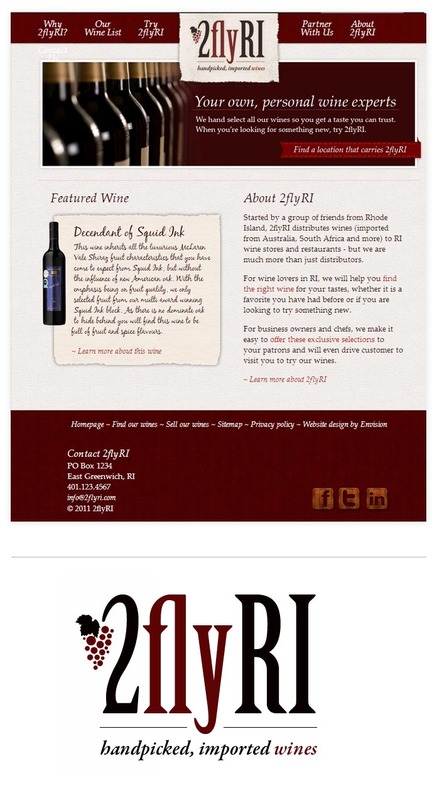 2flyRI imports "fine, handpicked wines" to Rhode Island from Australia, South Africa, and more. One of the company's founders is someone I've worked with for years, so when he asked me to contribute some design work for the company, I was thrilled to help - being a lover of wine and all. My goal for the logo was something that had a clear tie to wine (since their name, 2flyRI, was not evident as to what they do). This is where the grapes and the burgundy color came from. For the letterforms, I wanted something with some character and a bit of class, without coming across as stuck-up or too exclusive. The wines they sell are good bottles at a mid-range price, so I wanted the logo to reflect this sense of quality without being unattainable or out-of-reach. Once the logo was developed, a website design was started which, I am sorry to say, was never saw the light of day. The design itself, which had a very rich feel with lots of textures and depth, was approved by the company, but hold ups of one kind or another kept the project from being completed. What I am showing here is the approved design of the website's homepage, along with the final logo, which was used for some marketing purposes. Sad as I was that this project was never launched, I can at least showcase it here in this project gallery.